Kalderetang Kambing, Pinoys are now used to kadereta cooked with kaldereta mixes and a lot of cheese. Some version are also cooked with sugar and peanut butter added. Today I would like to share a kaldereta recipe which does not use cheese and cooked with the traditional tomato sauce. Except for the use of green olives this kaldereta version is cooked near to the traditional country side cooking method. 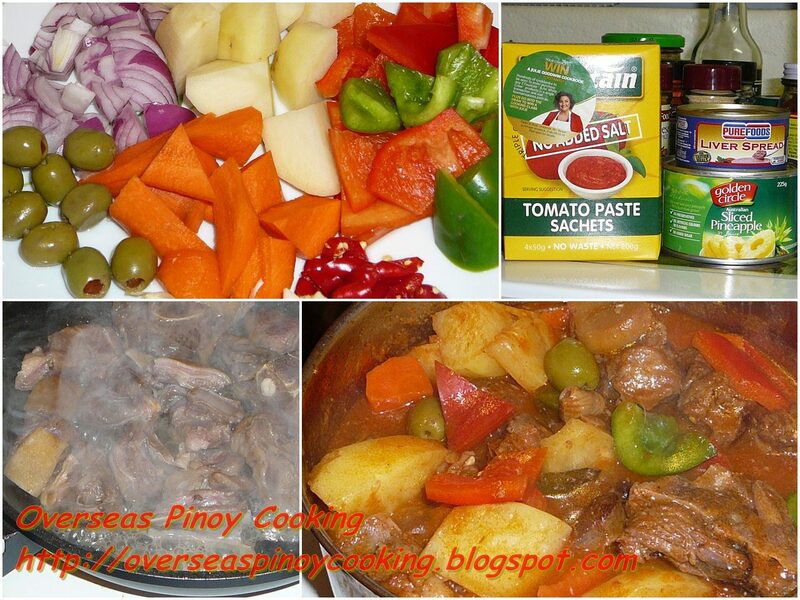 Goat meats are stewed with just tomato sauce and some pineapple juice from canned slices of pineapple. The green olives is an option you may use pickled cucumber if its not available. For added color a lot of red and green bell pepper , carrots and potatoes are also added. Here is the recipe.